Warning: If you read this post you’ll likely be sending holiday cards to your clients. It’s old news that insurance agents should be reaching out to their client base frequently. We published research last year with hard data supporting this idea; showing that, from a retention standpoint, of all insurance consumers that eventually defect, 81% do so because they lack regular and meaningful communication from their insurance agent. We also know that quality communication goes a long way to convert regular ol’ clients into promoters and inspires them to refer you to others. But the challenge can be finding opportunities to keep in front of your clients in a meaningful way. By now we know that drip e-mail campaigns aren’t up to the task. We get enough junk in our inboxes as it is. That pre-packaged email campaign you spent hours putting together is likely headed straight to the trash bin. Truth is, there are limited opportunities to make a positive impact on your clients throughout the year. So, when things like birthdays and holidays roll around you should be making the most of them. This is a perfect (and easy) opportunity to strengthen your client relationships and develop a more loyal client base. At Rocket Referrals we tell agents to pay special attention to their most loyal clients (promoters) because they are the ones recommending them to others. Therefore, much of our automated communication is aimed at collecting referrals from this segment of your client base. But for those of your clients that either didn’t respond to the NPS survey, or you don’t have their email address, communication is limited. In situations like this holiday cards are especially important to reconnect with clients that would otherwise fall through the cracks. Your goal is to create a positive experience that will encourage more clients to respond to the NPS survey next time around. This results in more promoters that’ll receive additional communication aimed at inspiring more referrals. The global management consulting firm Bain & Company performed research on the insurance industry and came to the conclusion that for businesses to achieve superior revenue growth they must both earn goodwill and also motivate their customers to actively promote them. Holiday cards are specifically aimed at reinforcing the goodwill – a prerequisite for any referral strategy to be successful. At the end of the day insurance agents are selling relationships. The insurance products themselves have become largely commoditized, so it’s the stellar service and warm feelings that separate an agency from the pack. This is especially true today as direct carriers are turning up the heat on agents with improved communication and service. Personal relationships remain unique to agents, however, so you can still make the most of this competitive advantage. Holiday cards are an excellent way of telling the client how much you appreciate the relationship – and that you are willing to take the time to think of them personally. If you’re thinking about sending holiday emails instead of cards to save a couple bucks I highly suggest you reconsider. Here’s why. In the U.S. businesses send 50% more promotional emails during the holidays. Image how much junk your clients are already receiving in their inboxes during this time. A holiday email will likely won’t be read, and if it is it certainly won’t have the impact a handwritten card will. Your clients will think “Oh, gee! Jurgens Insurance sent me an animated Santa email” and then delete it instantly. Out of sight out of mind. Handwritten cards signify effort on your part. They are opened nearly 100% of the time. They are tangible. They can be strung up in front of the fireplace. Bottom line, your clients will appreciate them and they will have the positive impact you’re looking for; especially during the holiday season when family’s gather and talk – the perfect time to be top of mind! The average insurance agency is at risk of losing 20 to 25 percent of their clients each year. This includes clients that are upset for a very specific reason—like an unreturned phone call or poor experience—and those clients where the relationship has just generally eroded over time. Lack of meaningful communication will do that. The good news, however, is that most of these at-risk clients can be retained if communication is improved. They just need to know that their agent still has their back and that they care about them outside of renewal time. The great thing about holiday cards is that they achieve this goal because clients know they are optional. Their agent isn’t asking them for anything. So, when they see that GEICO commercial promising better rates they don’t pick up the phone and investigate. They have an agent that cares about them – they can’t get that by going direct. Insurance agents need to think about expenditures like holiday cards in terms of ROI. Unlike birthday cards, where the cost is spread out throughout the year, holiday cards are paid for all at once. This makes it more difficult to visualize the cost (and return) per client. At Rocket Referrals we understand that the cost of sending holiday cards to thousands of clients can add up. That’s part of the reason we offer a discount on them once a year. 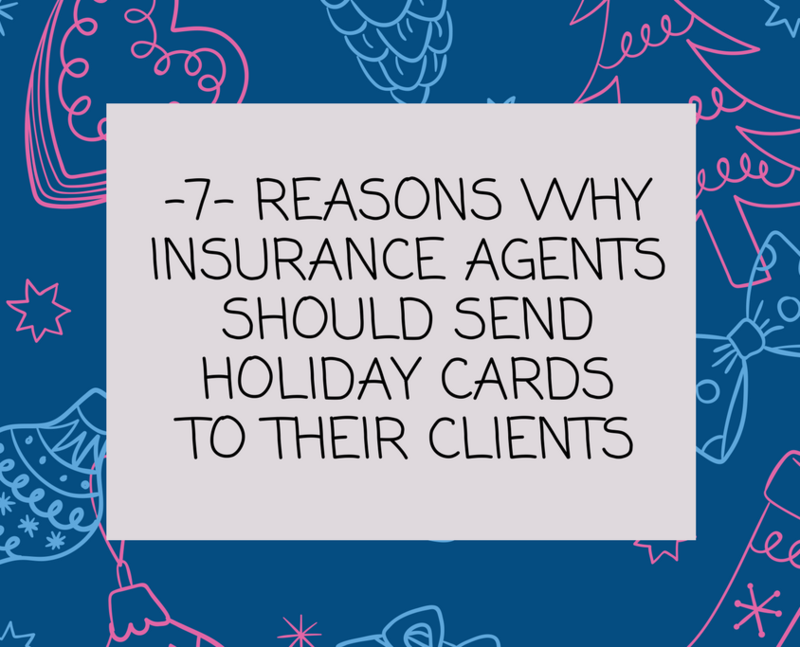 But we also want agents to realize that holiday cards are truly an investment in the client relationship which can have a significant impact on retention and referrals. Prior to Rocket Referrals, insurance agents had three options when the holidays approached. Painstakingly write the cards themselves, buy impersonal printed cards from another vendor, or not send cards at all. Each option is expensive in its own way. Either in time, lukewarm reception, or absence of communication. The great thing about our cards is we can deliver the quality of handwritten in about 5 minutes of your time and at a very competitive price. We did the math. For the average household, insurance agents receive commissions of about $430 per year (and that’s being conservative). If an agency sent a holiday card to each of their 2,000 clients (for example) using Rocket Referrals they need only retain 9 clients and keep them for only one year to break even. That’s only 1 out of every 200 people that receive a holiday card. This doesn’t even include the impact on new referrals. Wowsers. If you’re still on the fence about ordering holiday cards then give us a call or shoot us an email and we’ll answer any questions you have. Current Rocket Referrals clients can find the holiday card offer directly on their dashboard. If you aren’t currently a Rocket Referrals client then I invite you to checkout a quick demo.